The symposium resulted from the previous year’s meeting; having delivered a presentation looking at the ethical problems relating to Chinese fossil material and how these tie into funding, publishing, ownership and poor legislation, I was surrounded afterwards by other delegates with similar stories to tell. In order to discuss the issue in a much broader forum I suggested the symposium. I wanted a different analysis to the wearisome approach of some people in the community, who enthusiastically aid in demonising the commercial trade while simultaneously turning a blind eye to unethical or illegal activities of academic colleagues. Pretending that the issues are one-way is not only simplistic, it is detrimental: not only is private collecting for subsequent sale to researchers the very origin of our science (otherwise, as Dave Martill (University of Portsmouth) put it, Mary Anning is one of the most heinous criminals in the history of our field), but it remains essential in an age where little priority is given by most academic institutions to prospecting for new localities. Given that private and amateur collectors produce the vast majority of important specimens that allow our science to leap forward, there is little to be gained for academics by alienating them. Demonizing commercial trade is a lazy way of simplifying the ethical issues in palaeontology, effectively suppressing wider discussion and preventing development. John Martin delivers the keynote of the symposium. Photo courtesy of Tom Trapman. I originally became involved in ethics whilst working at Yunnan University in southern China where I encountered an academic who had illegally taken material out of the country from a restricted study area, prior to publishing the work, seemingly unchallenged, in a high-impact journal. Last year, a four-legged snake from Brazil brought this to the fore again, being published on in another high-impact journal despite its provenance being uncertain. Some journals now have policies requiring full provenance disclosure and responsible collecting, and call for deposition in a recognized repository, as well as ensuring that the original specimen collection complied with local legislation via the inclusion of permit details (for those looking to adopt suitable policies, evidence of legal export would also be useful). The publishing dimension highlights that this is a dance between science, politics and financial gain. This underpinned my invitation to Nicola Stead from PLoS ONE to speak at the symposium; she presented on their model for ethical scientific publishing. Indeed, would it not have over-emphasized publishing within the scope of the symposium, I would have been tempted to explore those links further as they extend into the area of open access. A recurrent problem raised in the symposium was that of bad legislation, enacted by those with little knowledge of that for which they are legislating (e.g. the new ‘Kulturschutzgesetz’ or Culture Protection Act, a German fossil protection law) and often overseen by individuals with little understanding of the requirements of our science. Archaeology is an extremely poor background for such considerations, rooted as it is in cultural identification that is entirely inappropriate for our subject, and art history, as has been used by the UK government, is even worse. This is one of the mires that regularly results from fossils inappropriately being referred to as ‘cultural’; as John Nudds (University of Manchester), the organizer of the 2001 GCG seminar on the commercial fossil trade put it, “the evolution of life did not take cognizance of today’s political boundaries”. To lump fossils in with cultural objects/cultural property/cultural heritage means that their primary significance as scientific objects is lost from any assessment process, and their inherent value obscured by shallow considerations of aesthetic or monetary value. Palaeontologists rarely have any discourse with those overseeing the legislation that their material falls under, so the scientific value of fossils under consideration is rarely taken into any account. I asked John Martin (University of Leicester) to give the keynote of the symposium, with an exploration of the terminology that tends to ensnare palaeontology – i.e. cultural heritage – and the wide range of different meanings to individuals and groups of people from lawyers to field-workers. Anthony Maltese (Rocky Mountain Dinosaur Resource Center) focused on the misuse of the term ‘commercial palaeontology’ – people being paid to do palaeontological work, which can include academics just as much as fossil dealers – and how that is very distinct from fossil poachers, as in the case of the Mongolian Tarbosaurus discussed in Newsletter 90. The commercial part is not the issue but it is the poaching that is the problem, and the two terms are very much not synonymous. Taissa Rodrigues (Universidade Federal do Espírito Santo) spoke from the perspective of one of the ‘source’ nations (as in Schmidt 2000) on the Brazilian legislation and ways that material and collaboration can be obtained, as well as protection for fossil sites. In my experience, there has been an almost neo-imperialistic attitude from some researchers, whereby they suggest they did not understand the laws/language of their hosts, and question their experience or facilities for research, resorting to illegal or legal export and exclusion of local researchers. More respect is needed in international engagement if it is to have some real integrity and not simply be a veneer over a latent imperial attitude to the resources of other nations. This is an issue that requires open global discussion, and the trend to criminalize private collectors, as noted by Dino Frey (Staatliches Museum für Naturkunde Karlsruhe) simply drives more specimens out of sight for science. Presentations on ethics have so far not been accepted at SVP, meaning that this fundamental issue is not being widely discussed at the largest annual gathering in the vertebrate palaeontological community. Without airing it as an important issue, there will be no global debate or understanding, ensuring that divisions and issues will continue. The variability of access to specimens, a point that naturally arises in connection with private collections, was explored by Dave Unwin (University of Leicester). Although recognized museums are hailed as the ideal, access standards vary widely with some public institutions thought guilty of ‘hoarding’ access, as well as disposing of collections that were supposed to be theirs in perpetuity. Some recognized repositories are not fully public (for example, the American Museum of Natural History), and there may be differences in relative standards of care between private collections and other repositories. As Kirby Siber (Sauriermuseum Aathal) noted, the question should be one of ongoing scientific access, and not confused with one of ownership – a point echoed by Paul Barrett (Natural History Museum, London), who argued for primacy of scientific access for reproducibility of results. In contrast, Oliver Rauhut (Bayerische Staatssammlung für Paläontologie und Geologie) contended that as reproducibility was not required for many natural phenomena (trackways being an example), the study of which was never questioned, that this should be secondary to the availability of the data in the first place. Charlie Underwood (Birkbeck, University of London) made a similar point regarding variable access, in terms of legislation restricting fossil site access to specific favoured institutions. 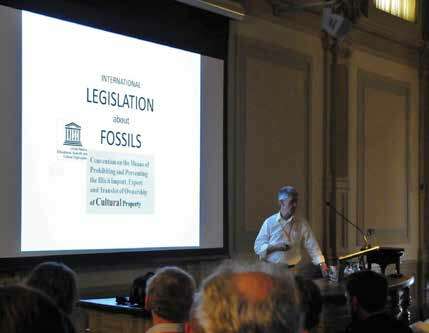 As well as Kirby Siber, Raimund Albersdörfer (Dinosaurierpark Altmühltal) echoed Dave Martill’s comment that fossil legislation almost always limits the number of fossils available to science, as well as promoting a black market. The new owner of a private quarry that had previously broken down over 98% of its Solnhofen lithographic limestone for building plaster, Albersdörfer demonstrated (extrapolating from what has been recovered from the 1.5 % that he has excavated in the last few years) the number of specimens that were likely to have been lost to science, through being converted to plaster over the previous 40 years of the quarry’s working life: 50 dinosaurs, 1,000 pterosaurs, 1,800 turtles, 18,000 fish specimens and 600 sphenodonts. In contrast, from the 1.5 % that he had excavated and retailed, some had indeed reached public collections. Albersdörfer observed that the history of a lack of restrictions for collecting in Bavaria was very much a positive one, and in contrast with the rest of the German provinces, and with the rest of the world. He suggested that the real force removing specimens from science is not the commercial sector, but quarrying and natural erosion, to which no one raises objections. At the end of the presentations was a roundtable discussion with a group of such different individuals that it had the potential to become inflammatory. As such, I found myself in the role of an inverted Jerry Springer, trying to ensure open discussion while avoiding conflict. However, there was no antagonism whatsoever; instead the consensus coalesced around education as the default problem that everyone complained about, and agreed on. Uninformed legislators are likely to produce poor legislation, resulting in ineffective rearguard actions from palaeontologists. To help address this recurring problem, Dino Frey proposed that the EAVP survey its members before the next annual meeting to assess what we as vertebrate palaeontologists want with respect to regulations regarding excavation and trade, whether from a commercial or a scientific perspective. With such a wide variety of member countries in the Association, the results are sure to be interesting. Perhaps two points emerged consistently from the day. First, in a science that relies on the private sector for the majority of its discoveries, alienating the commercial community is self-destructive. Secondly, in a world where legislation automatically creates black markets with attendant exploitation, we as a community have to be certain that any legislation that results, and the administration of that legislation, is both necessary and effective, and worth the problems that it creates, however inadvertently. Those further interested in this topic will find the entire symposium, including the after talks roundtable discussion, available to view online at Palaeocast (www.palaeocast.com/eavp-2016) and I express my gratitude to Dave Marshall for filming it for us. Proceedings of the meeting are scheduled to become available in Geological Curator next year. LISTON, J. J. and YOU, H-L. 2015. Chinese fossil protection law and the illegal export of vertebrate fossils from China. Journal of Vertebrate Paleontology, 35, 1–7. LISTON, J. J. 2014. Fossil protection legislation: Chinese issues, global problems. Biological Journal of the Linnean Society, 113, 694–706. LISTON, J. J. 2013. Out of China: dinosaur eggs and the law on ‘Kong Long Dan’. Geological Curator, 9, 545–555. SCHMIDT, A. C. 2000. The Confuciusornis sanctus: an examination of Chinese cultural property law and policy in action. Boston College International and Comparative Law Review, 22, 185–228.